Although there are advanced and experienced paintball players who are willing to shell out more than a thousand dollars to get a high-end paintball marker or gun, take note that you do not have to force yourself to spend that much money, especially if you are on a budget. In fact, with thorough research, you can find the best paintball gun under 200. You do not have to worry even if you decide to get the best cheap paintball gun as you can still expect these low-priced and affordable options to give the same level of excitement that other markers and guns provide. You just have to make sure that you scour the market and other online sources to find the lowest-priced paintball gun with a high level of quality and durability. 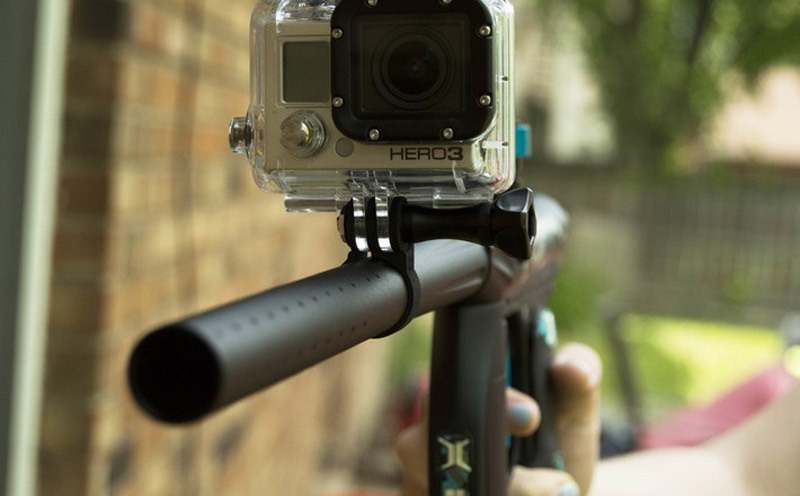 The following are just some of the paintball guns under $200 that are worth checking out. Take time to read our mini-reviews so you can learn more about each gun and its pros and cons. Hopefully, it can help you decide on the most appropriate marker for your specific needs. One of the most reliable markers I noticed in the market is the TMC MAGFED offered by Tippmann. I find it truly suitable for a woodsball player who wishes to play distance and up-close games. Upon use, I figured out that the TMC MAGFED works as a paintball marker with various strengths, especially for players who wish to mix things up. It is a magazine-fed marker, actually but take note that it also boasts of a dual-feeding system. I think that this system is one of the product’s major highlights as it lets users choose between the magazine and the hopper based on their preference. It also works as a fully pneumatic marker, requiring you to fill it up regardless of your chosen feeding system. No matter what you choose, I can assure you that the TMC MAGFED can help you shoot fast and with a high level of accuracy. Anyone can also instantly say that it is a hot option for the majority of paintball players. It is mainly because aside from its in-line bolt system, it also has a genuine AR15 look. Despite its size, it is also incredibly lightweight, which means it will never compromise your movements and performance on the paintball field. In addition, such lightness gives you the chance of adding your preferred upgrades without having to worry about it becoming too heavy. This means that it is not only fully functional but is also customizable. One of the drawbacks reported by some of the users of this paintball marker, though, is that it is prone to breaking down after being used for a long period of time. With its streamlined design and durable overall construction, I can say that the Azodin Blitz 3 is one of the best-performing paintball markers/guns in the industry. 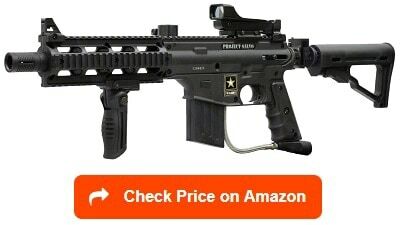 It is actually an advanced paintball marker model, which I specifically like because of its solid and dependable frame. I instantly noticed how it works as an all-around paintball gun. It works well for a fun day of shooting with your friends or loved ones or when planning to enjoy a tournament. It is a lightweight marker, thereby promoting ease in carrying around without slowing you down. One thing that I think is the main reason why the Azodin Blitz 3 continues to stand out is its reliability. It has a frame constructed out of nylon-reinforced composite material, which means that it will never fail you while you are on the field. Such is indeed a solid and dependable frame that is helpful, especially in challenging playing environments. It is an efficient paintball marker, too, as it runs smoothly while ensuring that you save a lot on your precious gas. It makes use of a piston featuring an integrated seat, making it possible to use the least amount of gas. Furthermore, it is a powerful gun while still ensuring that it stays remarkably quiet while you are on the field. With its quietness, you can improve your gameplay as your opponents will have a hard time seeing you plus you can also hear them when they are moving around, giving you the opportunity to attack them at the right time. One issue that you have to be aware of about this paintball gun, though, is that it is not equipped with a quick-clamp feed neck. 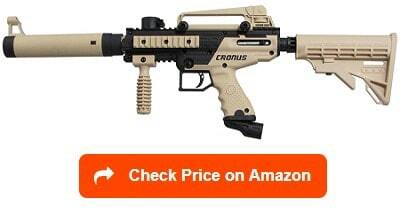 I think that your goal of finding the best paintball gun under 200 can also be accomplished by checking out and investing in the Cronus Basic Marker offered by Tippmann. Many consider this basic paintball marker as the perfect gun for those who are still starting to learn the ins and outs of paintballing. What I like about it is that it is designed to be solid and sturdy in the sense that it can survive the rigors and challenges linked to tough outdoor environments. 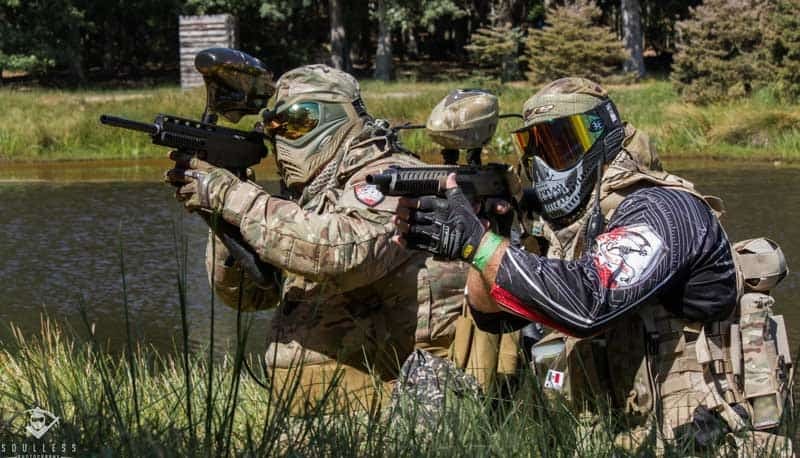 Aside from working well for beginners, I noticed that it also suits the needs of intermediate paintball players. I find its overall built impressive because the rigid composite material used in it is guaranteed to be long-lasting. I like the cool look of the gun’s body, too, as it showcases the military simulation (mil-sim) style. The lightweight nature of this Tippmann paintball marker also means that even young players, as well as those with poor endurance and are small in stature, can still hold, carry, and use it with ease. Holding it is also easy considering the fact that it has molded rubber grips. Furthermore, you will find it comfortable to use. You can even move around with ease even in tensed moments because of its internal gas line. What is even better about this paintball marker is that you can upgrade it into a full tactical marker. Another reason for its popularity is that it shoots and fires well and accurately. It has little recoil, too. However, some users say that it is sometimes necessary to upgrade the stock barrel of this gun to further improve its accuracy. Upgrading the stock barrel might still be necessary for boosting its accuracy. Another of the best paintball gun under 200 that continues to leave a positive impact and good impression on the majority of paintball players is the Cronus Tactical Marker from Tippmann. What is so remarkable about this super reliable paintball marker is that it combines fantastic sturdiness, style, and accuracy in just a single product. It is ideal for beginners and intermediate players considering its reliability as well as the fact that it is highly accurate and user-friendly. I am happy that this marker is lightweight, too, as it means that carrying it around will never become an issue. Despite the lightness of its overall construction, it is still durable. This means that you have peace of mind as it will never break too soon. I am glad that this paintball marker requires the least amount of maintenance, too, considering the fact that it is built to last longer than the others. Disassembling its parts and cleaning them up is also easy as you can easily open up the marker. The highly rated in-line bolt system, as well as the internal gas line integrated into this marker, are also among its remarkable features. Both can help you enjoy utmost comfort and a better grip, thereby ensuring that you will enjoy your gameplay no matter how long the session takes. The reliable in-line bolt system works in preventing the risk of chopping, too. Furthermore, it has an ergonomic gas intake angle, which is a major help in keeping the tank out of your way. One issue with this tactical paintball marker, though, is that its collapsible stock is constructed out of a slightly flimsy material. The collapsible stock is based on a slightly flimsy material. 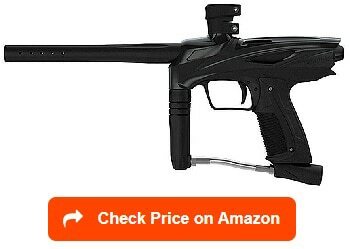 If you are after reliability and dependability when searching for a good paintball gun under $200 then I am sure that the GOG enMEY will never cause any form of disappointment. This specific marker actually stands out in the sense that it works for both newcomers as well as experienced veterans in the field. It has a simple design on its exteriors, which follows the one that you usually see in the industry. It comes with a heavy-duty pistol grip, paintball loader on top, forward grip, and an air tank at the bottom. Despite the simplicity of its design, it tends to win the attention of many on the way it fires the ball. It is because it makes use of the highly advanced pneumatic design as a means of propelling the balls forward. In other words, you do not need to depend on batteries, springs, and hammers to ensure that the paintballs fly. Because it has a lower number of parts, I am sure that it can last longer since it will not break down that fast. I am impressed with the heavy plastic used in the gun’s overall construction as it makes it more solid, capable of holding up to almost all gameplay situations and environments you are exposed in. Even if it has a really solid construction, it still maintains its lightness. It is still lightweight even if it is fully loaded. It is also capable of enhancing the firing ability of the gun with the help of its anti-chop technology and its low-bolt pressure. Furthermore, it boasts of a firing rate and a high level of accuracy that makes it totally comfortable to use among various players, even new ones. However, remember that this paintball marker comes with a simple and industry-standard design, which means that it lacks some of the advanced features present in high-end models. 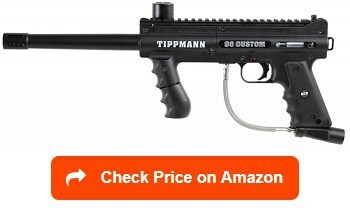 Another paintball gun that you have to consider including in your list of options if you are on a hunt for a reliable one under $200 is the 98 Platinum Series .68 Caliber, which is offered by the trusted Tippmann brand. It is designed to help anyone improve their gameplay while ensuring that they enjoy the entire experience. One unique thing I noticed in this gun is that it is possible to customize its look and make some upgrades on its performance once you are ready to take your game to a more serious level. Among the upgrades that you can do in this marker are on its cyclone feed system, response trigger, and its e-trigger kit. The highly reliable performance of this semi-automatic paintball marker, which you can easily use is one of the reasons why you can also easily upgrade it. I am pleased with the split receiver design used in this Tippmann paintball marker, too. It is because such design makes it possible to access the internal components quickly. With that, installing your preferred modifications and upgrades can be done with ease. I am sure that you will also feel be pleased with the presence of the Picatinny trail built on top of the gun. 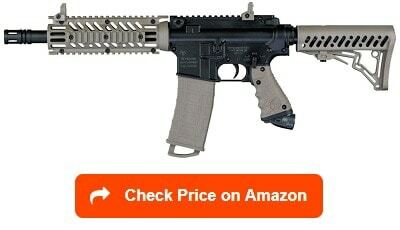 It is because it promotes ease in adding scopes, carry handle, and other possible modifications. With the built-in anti-chop technology in this gun, you also have an assurance that it can significantly lessen the probability of paint breakage. 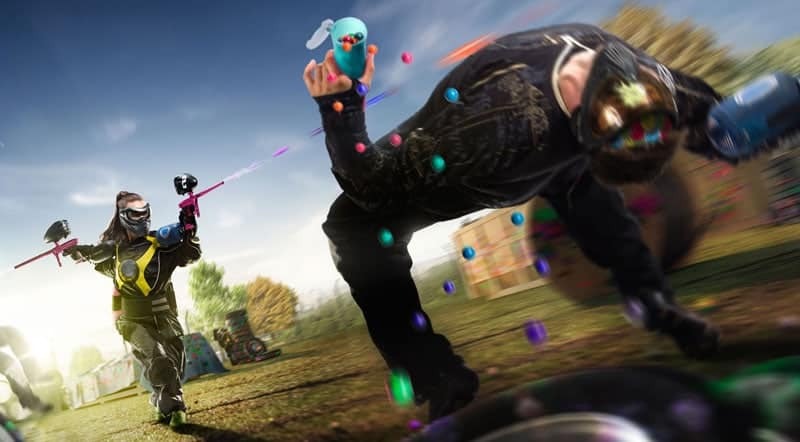 However, one of the complaints of its users is that it seems to be louder in comparison to other paintball markers today. The look is customizable and the gun and its performance are upgradable. 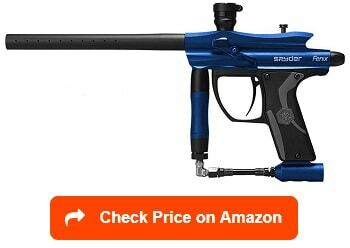 You can also choose the top-rated Azodin Kaos 2 Paintball Gun. 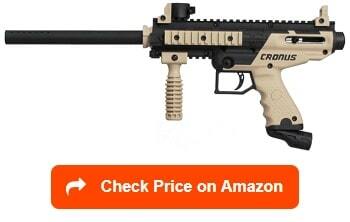 I think it is a pretty good entry-level paintball marker, which is offered at a cheap price. I find its design totally simple but it is still reliable and flexible in the sense that it is possible to use it in various settings and playing environments. I noticed that it has a simple pop-valve design, which is very easy to work with. Such design also means that it only has few moving components, parts, and seals. With that, it provides a no-nonsense approach when it comes to operating it. It is also less prone to showing firing issues and leaks on the springs. Disassembling the paintball marker is also easy. In fact, it is possible for you to disassemble its parts in just five minutes, which is actually beneficial in case you need to clean it or replace its O-rings. The paintball marker is very lightweight, too, which means that it has internal parts that are not as troublesome when you fire it. With such benefit, you have an assurance that there will be a minimal recoil while you, yourself, experience utmost comfort. I am also impressed with the level of comfort that this gun can make anyone feel – that is all thanks to the built-in rubber grip frame panels. It is also an accurate marker. In comparison to other paintball guns, this one provides a better performance when it comes to long-distance accuracy. However, it has a drawback, which includes the fact that it operates at a high pressure, causing it to be pretty loud. 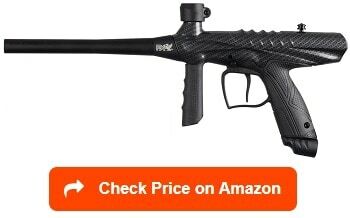 I also like to recommend the Gryphon Paintball Gun introduced by the Tippmann brand, which works for both casual players and beginners. 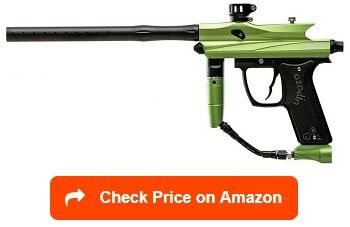 One thing I like the most about this paintball marker is the fact that it has an affordable price tag while still retaining its quality. This marker looks good and also works with a lightweight inline blowback design. Such design is simple and classic, which is mainly based on the Model 98 with the exception of the top-cocking bolt. I find its grip comfortable, which is a big advantage. It also features a locking vertical feed, which you can use to place the hopper. One more thing I like about the Gryphon is its sleek look brought on by its internal gas line. It has a sturdy and durable construction, too, which means that you no longer have to worry about the gun breaking down easily. The product comes with a pair of safety goggles designed to give your eyes protection against injuries. It is mainly constructed out of aluminum material, which is the reason behind its lightness. In addition, it has a compact design, which, I am sure, will give you an easier time carrying it around, especially when running around the field. It can accurately fire up to a max of 150 feet distance. It is also capable of firing up to 8 balls every second. This gun packs a lot of power, is easy to use, requires less maintenance, and is highly accurate. However, take note that it is not customizable and upgradable. If you are interested in buying an electronic paintball gun then the Spyder Fenix is one of the products I will instantly recommend to you. One of the most distinctive features I discovered in the Spyder Fenix Electronic Paintball Marker is its valve system. It is because it utilizes a unique and special Eko valve system. Such makes use of a unique technology, which is available only on the markers of the brand. With such valve, the marker is capable of ripping off up to 1,600 shots using a 20-oz. CO tank. In other words, it is capable of doubling the capacity of shots provided by an average tank. Another thing that I can say is remarkable about the paintball marker is that it lets users make some changes between semi-automatic quick ramping efficiently. It is mainly because of the electronic trigger frame present in the marker. With that, it is no longer surprising to see its users saying that this marker is totally flexible. In addition, it has a clamping feed neck capable of shooting up to 25 balls every second. I am also happy with the break beam eye technology in this paintball gun because it works efficiently as an anti-chop system. With such system, there is a lower risk that the gun will fire paintballs unless all of them are already settled well in the chamber. You can also expect it to stop the chopping of the paintball balls while maintaining the cleanliness in the marker. It also boasts of its velocity adjuster as well as the adjustable inline regulator, which is helpful in promoting quick charges. One issue, though, is that the magnetic response trigger integrated into this paintball gun is not as responsive as what others initially expected. Another fantastic paintball marker offered by Tippmann to its customers is the Project Salvo Sniper M-FDP Edition. It is designed with the standard 11-inch anodized quick-thread barrel, stock, shroud, and rails. What is good about this .68 caliber marker is that it is also easy to pair the standard paintballs present in local stores. 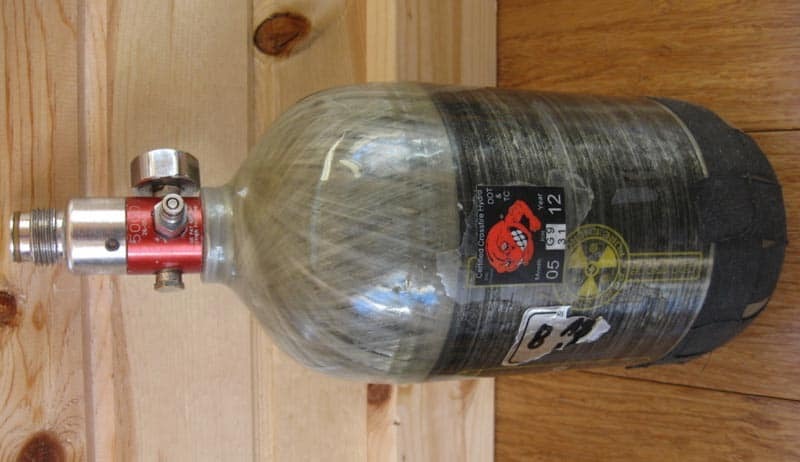 It is also flexible as its semi-automatic mechanism with an open bolt blow-back system can actually operate using highly pressurized air, nitrogen, or CO2. I am pretty satisfied with the cycle rate of this paintball marker as it has the capability of firing at around 8 paintballs every second. It also promotes ease when it comes to attaching accessories with the help of the 4 Picatinny rails found on its front shroud. Despite shooting at an almost similar way as the other guns offered in the same price range, this marker from Tippmann is still a big advantage because it does such shooting in a relatively quiet manner. This paintball gun also boasts of its rock-solid dependability and reliability. Furthermore, I find it pleasing because of its dexterity. You can position it in multiple ways with ease. I can say that it has one of the most impressive looks among the many paintball markers in the market. It is mainly because it specifically follows the mold of the AR15 firearm used in the US army. 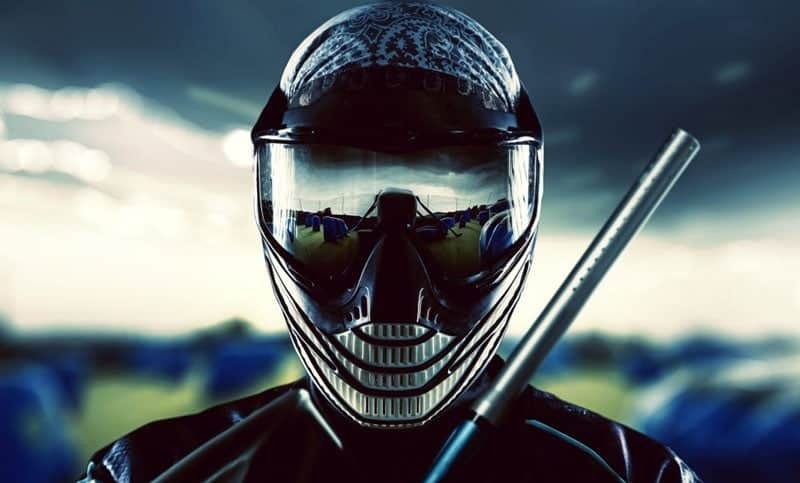 However, you have to take note of the fact that it is not that suitable for speedball and tournaments as it is heavier when compared to other paintball markers available today. Every paintball enthusiast knows that choosing the right marker or gun for the job is not that easy as numerous choices emerged in the market nowadays. If you are still a confused buyer then help us enlighten you and make the most informed decision by ensuring that you keep in mind these factors during the selection process. 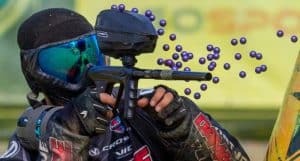 One important aspect you have to carefully take into full consideration in your search for the best paintball marker is the level of commitment you have to the game of paintball. This means you have to assess just how much and how often you would like to play the game. In case you wish to play several times every week then investing a more durable and better paintball marker – one that is guaranteed to last long – is advisable. However, if you are only an occasional player then you might consider just renting one, instead. This can save you a lot of money. It is also advisable to take into full consideration the specific facility where you will be playing paintball. Remember that different facilities also hold different regulations and rules, so you have to consider them prior to buying your gun, especially if you are a first-timer or a beginner. If possible, check the website of the facility or ask their representative or staff prior to buying a gun. 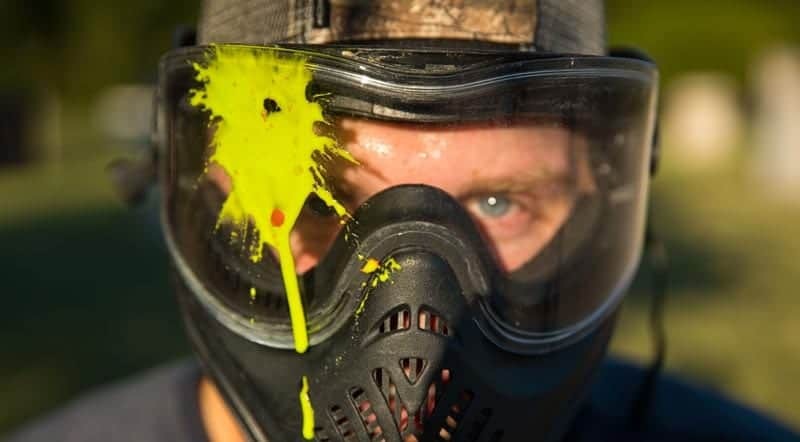 For example, some facilities may have rules on the number of paintballs that the marker can fire every second to guarantee the safety of players. You might also find facilities that do not allow fully automatic guns. You have to familiarize yourself with the rules in the specific facility where you plan to play as this is the key to figuring out which gun is indeed right for you. 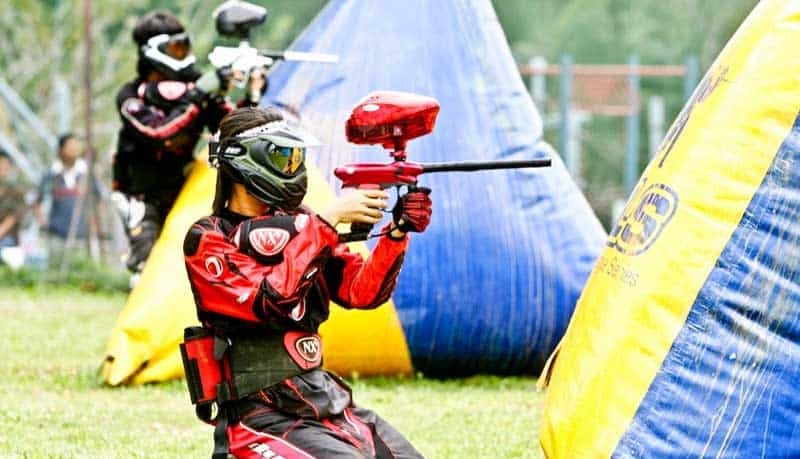 ​Another thing to take note of is the specific type of paintball game you prefer to play most of the time. It is mainly because your preferred game can contribute a lot to the kind of gun you need to use. If you prefer to play woodsball, for instance, then look for a gun, which can accurately shoot longer distances. Speedball, on the other hand, needs a paintball marker, which is capable of firing multiple shots in a quick and accurate manner. For scenario games, your goal should be to focus on the gun’s aesthetics. Overall, it is important to think about the environment you will be playing, the type of game you prefer, and the specific marker that can help you succeed. It is also necessary for you to think about the specific position you wish to play. 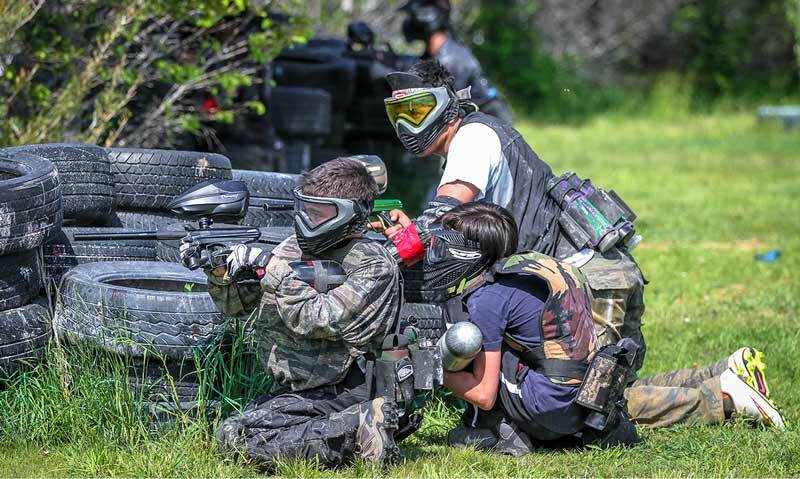 Note that you will have a higher chance of succeeding in paintball if you consider the specific things you have to accomplish based on your position and the specific marker that can help you achieve such goal. For example, if you hold the sniper position, then it would be best for you to find a gun capable of shooting a long range. A runner or frontman, on the other hand, requires a gun, which is not too heavy. Examine the weight of the gun or marker, too. Go for a lightweight one as much as possible. Remember that aside from having to carry the marker around, it is also important for you to master the art of moving it discreetly and quickly in case you wish to stay within the game. Choose a lighter model as it can also improve your mobility. 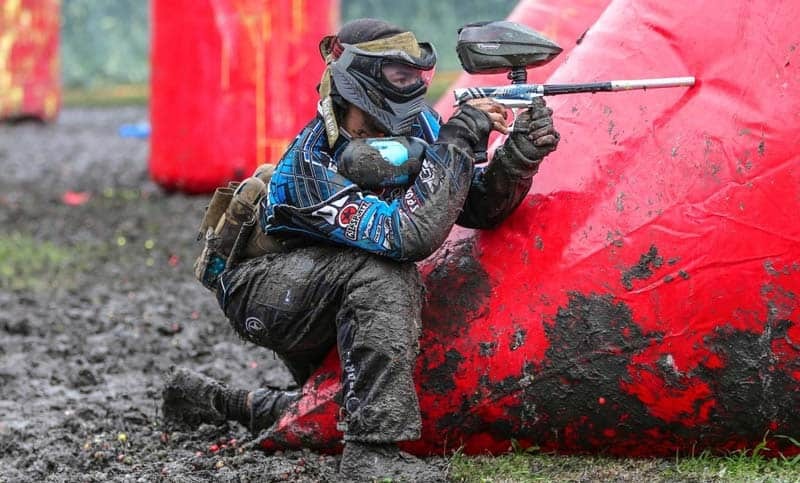 Aside from letting you move with ease, a lightweight paintball marker or gun can also help ensure that you will not get too tired easily once you carry it around the field. The type, in this case, refers to whether you need a pump or an automatic gun. In addition to hunting for a high-quality paintball gun, which is well-constructed, it is also crucial to decide whether you will be needing a semi-automatic gun or a pump. In general, those in a match use similar kinds of weapon. This means that if the others utilize a semi-automatic gun then you also need to use the same. Doing such will prevent you from getting outmatched just in case you bring a pump-action marker when all the others are using the semi-automatic type. Also, take note that both these guns are reliable options but they have different functions. In this case, find out what the other players are using. Also, remember that each one has a unique style of playing. In case you are someone who tends to act like a sniper, especially once you are in the middle of a match then look for a gun capable of supporting such playing style. Another crucial factor that you have to keep in mind is where the hopper is placed. In this case, your options include the offset or the center-fed placement. Center-fed paintball guns actually have the hopper in the middle. With such placement, you can effectively aim from both sides of the weapon. The offset type, on the other hand, has the tendency of limiting your line of site, especially if you plan on aiming from the specific side where the hopper is on. 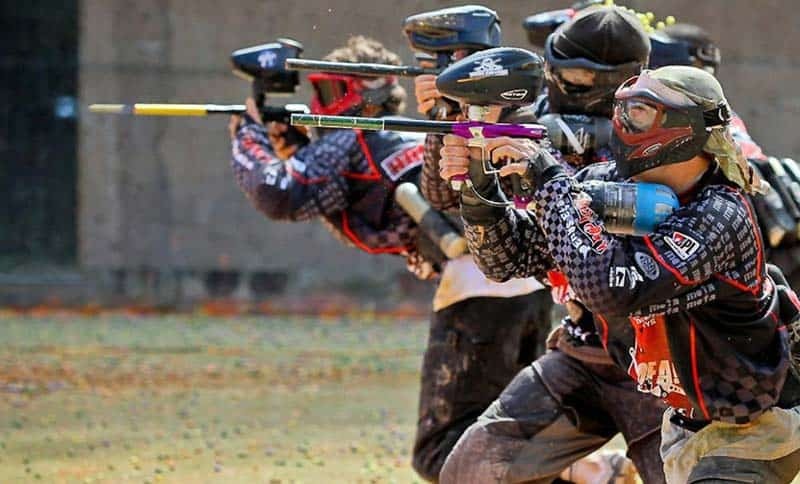 The placement of the hopper is a crucial factor for most paintball players, especially for those who wish to get involved in a close-combat playing style. It is also a crucial factor to consider, especially if you wish to be capable of aiming it around both sides of the obstacle. Ensure that the hopper is not ill-placed because an improper placement may only significantly lessen your ability to properly aim the weapon. It might also increase your chance of getting shot as it might expose your body. What does the paintball gun come included with? The answer specifically depends on your chosen package. In this case, I highly advise checking out discount package deals. This is especially helpful if you are still a beginner and still unsure and clueless about the other items and things you need. Conduct a research about the different discount package deals and their inclusions. What is good about the majority of paintball gun discount package deals is that they can eliminate the guesswork involved in not knowing exactly the specific supplies you need. It is because they form part of the kit. The best packages include everything you need, including the gun itself, as well as air tanks, paintballs, loaders, and masks. With that, they can indeed make the whole shopping experience more convenient and easier while also letting you save money. You can even find such packages under $200. Buying the best paintball marker under 200 can be a daunting and scary task, especially if it is your first time to do so. You might get confused with all the available features and unfamiliar terms used in the industry. However, you can minimize the difficulty during the selection process with proper and thorough research. Conduct a research about all your available options. Compare their pros and cons and figure out which one is the most appropriate for you based on your exact preference and playing style. 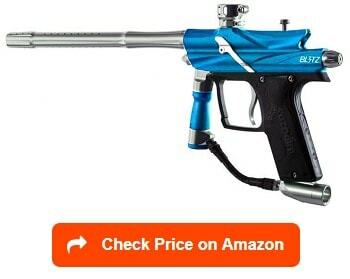 Learn more about how to choose the best paintball guns, under 300 and best paintball masks 2019 with in depth reviews and buyer’s guide. By the way, please have a look at our best paintballs, best paintball hoppers, best paintball tanks and best paintball barrels to improve your paintball game!